It is believed that the earliest settlers were tribes that migrated from Africa around 2000 BC and the Romans arrived in 218 BC and named the entire peninsula Hispania. Visigoths took over when the Romans left and in 711 North African moors conquered the land and ruled until expelled five centuries later. The Moors named the land Al Andalus, the West, and altered the prevailing culture in tremendous ways. They introduced higher hygiene and literacy standards, algebra, trigonometry, pharmacology, new forms of architecture and added almonds, saffron, lemons, rice and sugar cane to the diet. Azulejos, the glazed ceramic tiles for which Portugal is noted, were also a gift from the Moors who used them to embellish their floors, walls and ceilings. Portugal was the most western portion of the Muslim Empire and they established their capital at Xelb, now Silves. In general the religions coexisted under Moorish rule. 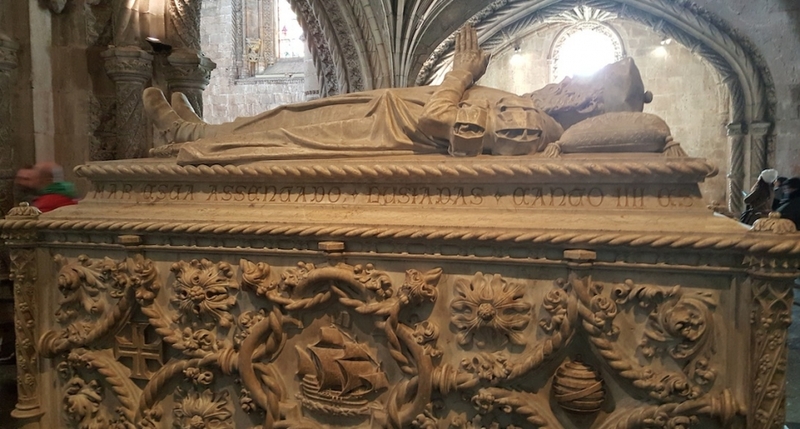 The Christians set out to reconquer the peninsula and during that time, in 1139, Afonso I took the throne. In 1415 Portugal conquered Cueta in North Africa and the country’s Golden Age of discovery and exploration began. Portugal was the first to trade within West Africa, and, in 1441, Captain Antam Gonçalvez became the first to raid and capture Africans and begin the transatlantic slave trade. He captured less than ten people, 3-years later the first major slave voyage sent 6 ships and enslaved 235 Africans. 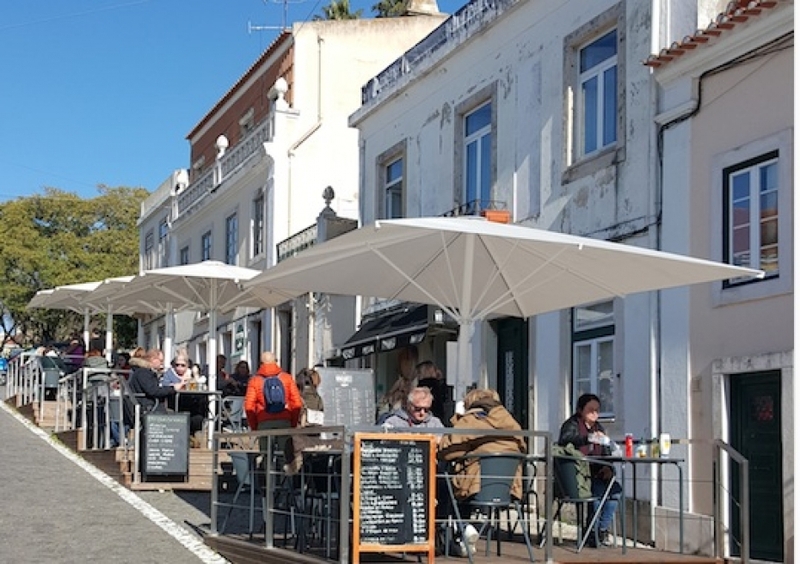 They were brought to Portugal and on August 8, 1444, in Lagos, Portugal, the first slave market was held and 20% of the profit was donated to the church. Eventually records indicate that Portugal kidnapped and transported more than 4,900,000 Africans. The Portuguese constructed the first slave fort, El Elmina, in Ghana and were under contract to supply the Spanish colonies with slaves. Lisbon, Portugal’s capitol, has always been an important maritime city and was said to have been founded by Ulysses on seven hills above the Targus River. The city’s focal point is the Castelo Sao Jorge, a Moorish citadel until rebuilt in 1511 as the king’s home. The streets surrounding it retain their medieval configurations. A river cruise is an ideal way to obtain an overview of Lisbon and gain a sense of its seafaring importance. Highlights of a cruise are the Ponte 25 de Abril Bridge and Cristo Rei. The bridge is reminiscent of the Golden Gate and is ½ mile long. Nearby is the 92-ft. tall Christ statue atop a 269-ft. pedestal. 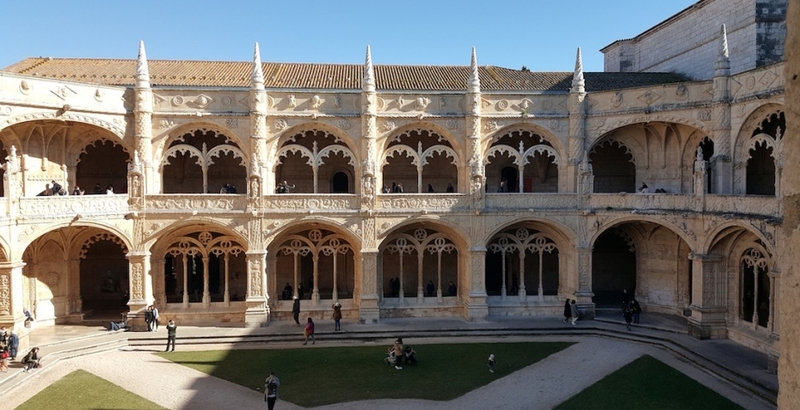 Lisbon was pivotal to the slave trade and many of its most visited sites are connected to that history. The Guinea House, in Praça do Comercio, was the trade’s custom house. There records were kept and taxes were collected. It was destroyed in the 1755 earthquake. A major slave market was also located here. Mocambo was an area where blacks settled and the name, African for refuge, speaks volumes. The community dates from the 1500s, home to both free, enslaved and fugitive blacks, it was a spiritual place. In 1515 a black mass burial pit, Poço dos Negros, was established there for internment of dead blacks. Central to Rossio Square is the Memorial as Vitimas do Massacre Judaico de 1506 . 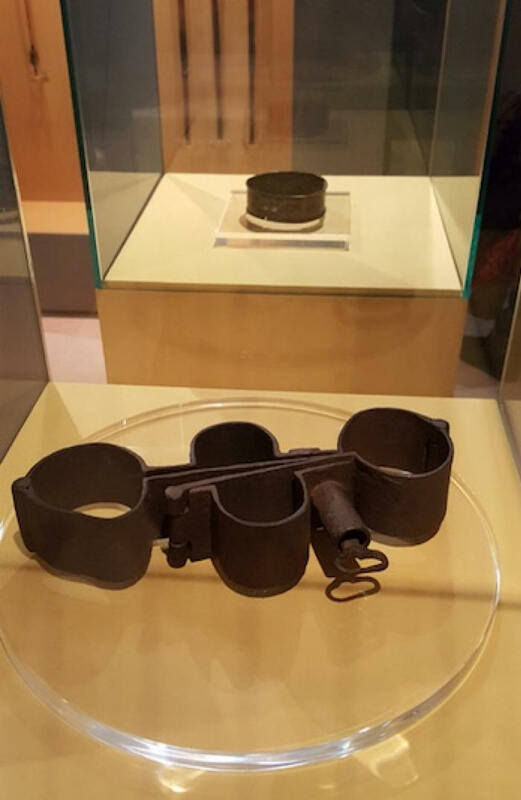 It memorializes the execution of more than 2,000 people accused of being Jewish. This event is said to be a precurser to the 1536 Portuguese Inquisition. During the 15th-century the square was a gathering place for blacks. 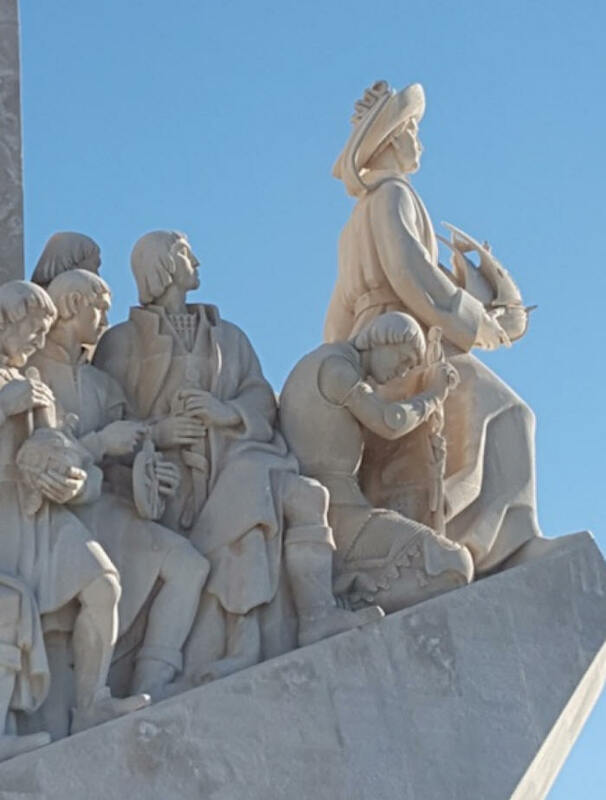 Belém is the historic section of Lisbon most closely linked with the Golden Age of Discovery. 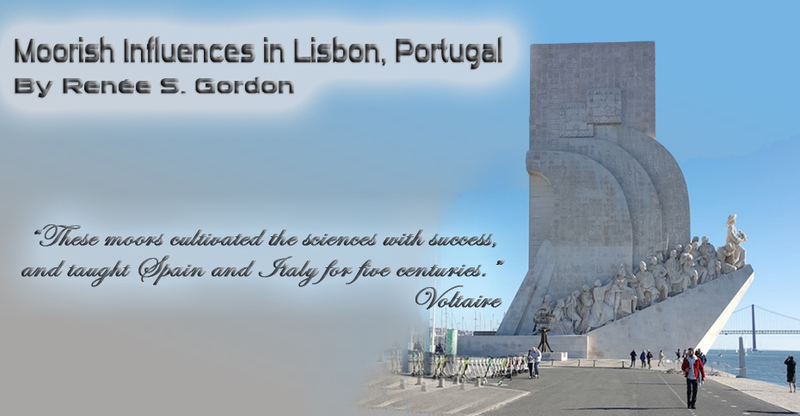 There are sites that must be visited including the Padrao dos Descobrimentos, the Monument of the Discoverers. The 1960 monument is 170-ft. tall and thirty-two people who impacted the events are depicted. Prince Henry the Navigator faces Africa. The design is that of a ship and imbedded in the courtyard is a compass showing the exploration routes. 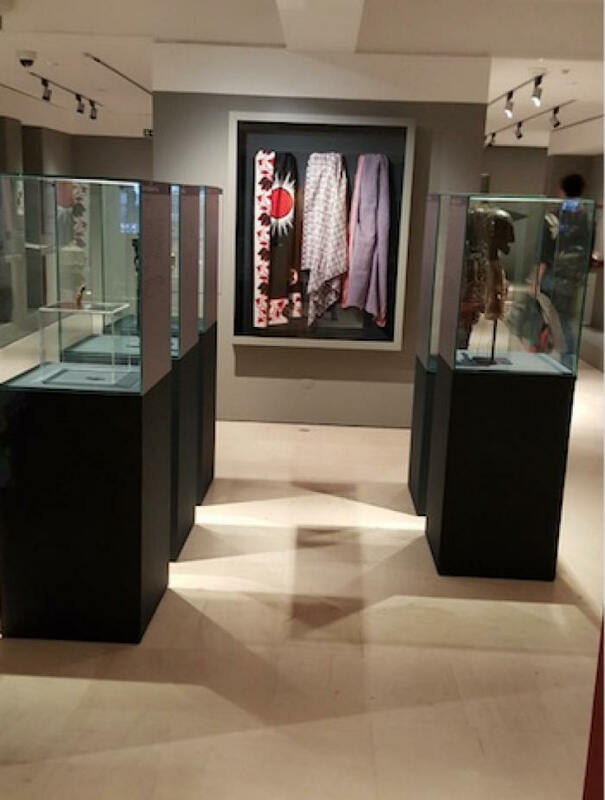 An exhibition inside, displayed until April, showcases 43 significant African artifacts. 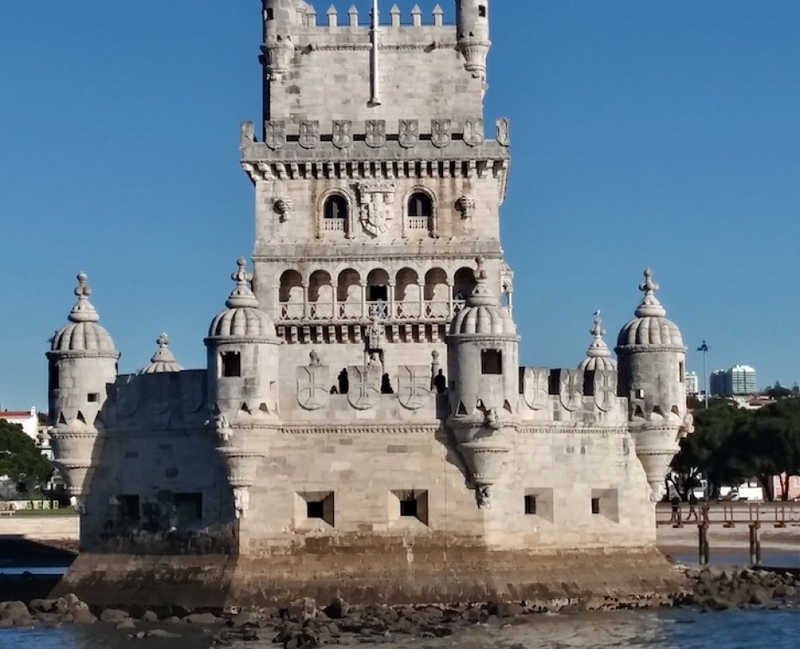 The 1521 Torre of Belém was constructed on the river as part of a defense system and is still on its original footprint. The lower floors were public spaces while the third floor housed the royal apartments. The exterior is beautifully carved and the interior is Gothic. The Moorish details include the watchtowers and cupolas. Pope Nicholas V issued a papal bull in 1455 that sanctioned Prince Henry’s slavery efforts. 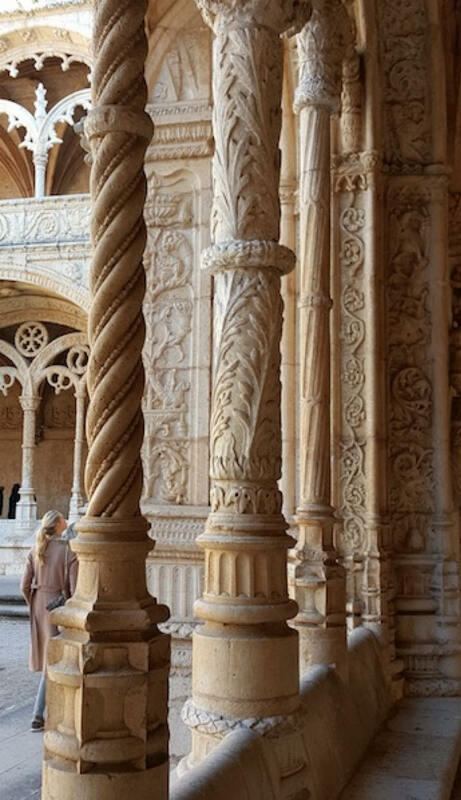 It was read aloud in the Lisbon Cathedral. It legalized perpetual enslavement of pagans. Sé de Lisboa Cathedral, dating from the 1100s, was built on the site of a ruined mosque by Christian crusaders. Four features are very important, the Romanesque rose window, the South Portal, the tomb of Vasco da Gama and the baptismal font said to have been used to baptize St. Anthony. Adjacent to the cathedral is the UNESCO World Heritage Monastery of St. Jeronimos where da Gama spent his final night before embarking on his far East journey in 1497. The two-level cloister is highly ornate and filled with Moorish elements. It is overseen by the Hieronymites order whose task is to pray for the mariners. The nearby National Coach Museum houses the best European collection of royal carriages. Videos and artifacts provide background information on specifications and history. 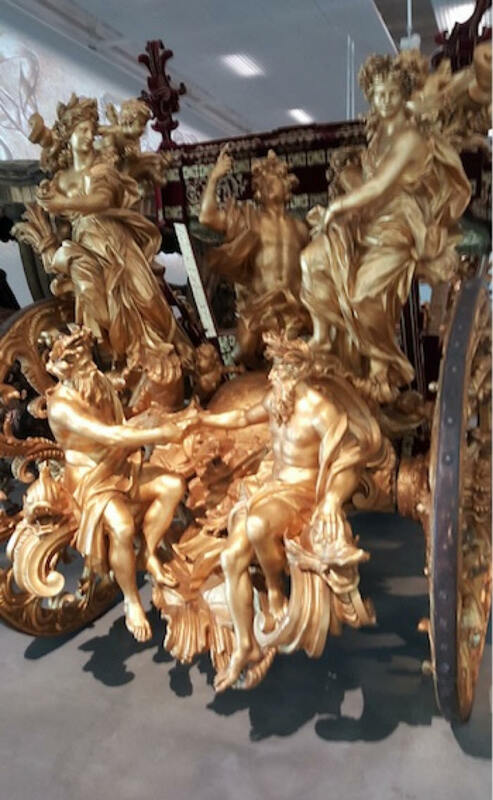 A highlight of the museum is a papal carriage.